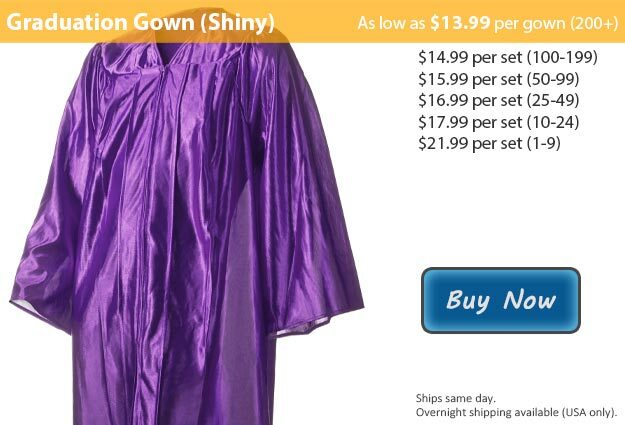 Shiny purple graduation gowns are the ideal choice for those graduating with their law degree, or it is also common for graduating students to match their robe with their school color. It has been a long time coming, and thanks to your complete dedication and maximum efforts along the way you have finally reached your goals of graduation. Here at Honors Graduation we have everything you might need or want to get ready for this memorable day. From the graduation gowns that you wear during your ceremony to various keepsakes such as keychains & year charms, we have it all. Graduation is the time to celebrate all of your hard work, a time when your friends and family come together in order to honor you for your success. I'm sure there were a number of obstacles in your path but thanks to your consistency, and maybe a little bit of help from your friends, you were victorious! Now you know that you are capable of anything that you set your mind to. As you close this chapter in your life the beginning of your next adventure is just around the corner. This graduation robe is also available in Purple Matte Fabric.